Caba Innovatives is the only institute since 1993 that provides 100% JOB Guaranteed Courses or Money Back. CABA originally Computer Aided Business Animation was named upon the logic of doing business with art and enhancing technology. Caba Innovatives was established in 1993 in New Delhi. A pioneer in Multimedia Animation Courses, Graphic Design Courses, Web Designing Course. Courses at Caba Innovatives are highest in demand in the industry and widely accepted by companies in India or abroad. CABA has to its proud distinction the acceptance and recognition of its candidates by almost all the well known names in the IT industry and many MNC companies. 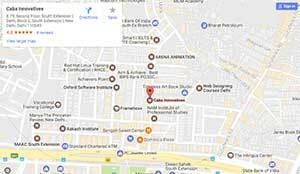 Caba Innovatives have achieved many awards since 1993 in the field of training as one of the most focused and quality training institutes in Delhi. Although it is unusual for an educational multimedia animation institute to provide any type of job guarantee, Caba is different. At Caba, we believe that merely promising “job assistance” or “placement assistance” is no longer enough and unfair to students. As they say, the proof is always in the pudding and we are confident that once you complete our 18-month Diploma in Multimedia, VFX, Graphics, Web & Animation Course, we will find you a well paying job in the industry. The moment you step into Caba to seek admission or to explore possibilities, expect a warm welcome. The Master Diploma in Multimedia Animation course covers Graphics, Animation, Videos Editing, Special Effects & Web Design Course is a highly focused and in-depth professional training qualification designed to prepare students for careers in various concentrations within the specialisation of digital multimedia. The Master Diploma in Web Design and Web Development course is a highly focused and in-depth professional training qualification designed to prepare students for careers in various concentrations within the specialisation of Graphics, Responsive Web Design, Video, Web Development, & E-commerce Portals. Graphic Design Courses and Desktop Publishing Courses are one of the highly focused and in-depth professional training qualification for graphic design and presentations, graphical wire frame designs, graphic designs for websites, graphic designs for web 2.0 with 100% Job Guarantee. The Advance Diploma in Multimedia Graphic Web Designing Course is a highly focused and in-depth professional training qualification designed to prepare students for careers in various concentrations within the specialisation of digital graphics, web designing, web animation, web hosting and advertising. The internet / digital marketing course is one of its kind in the entire country. Deep knowledge into digital media is rare to get. Caba Innovatives with expertise into digital marketing for more than 11 years today, introduces one of its kind courses in the market of education. This course is designed to make you proficient in nuances of digital art and animation which can help you achieve success in many career tracks in the future. specially digital graphics with 3D architecture and effects help shape better virtualisation in Interior Design Industry.